When it comes to sharing photographs, many people ask themselves – how to do that in a stylish and original way? 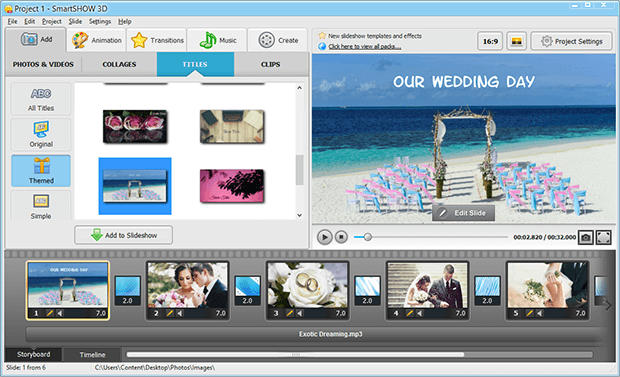 The answer is rather simple: make a slideshow with your photos! 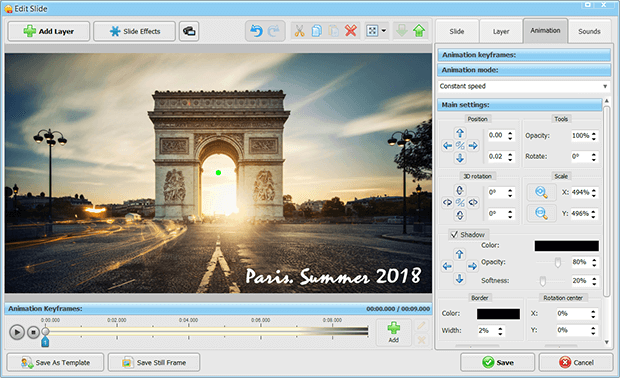 It will certainly take a little bit of effort to create a really stunning project, and of course a powerful slideshow making program comes in handy. Unleash your creativity with SmartSHOW 3D – a professional slideshow maker, and make amazing photo movies with unique special effects. Speaking about a perfect photo project, an important part of it are slideshow titles. They let the viewers get the overall idea of the movie, they introduce and finish the show and provide some comments in-between. Read on to learn how to make a slideshow with animated slide titles and clips. 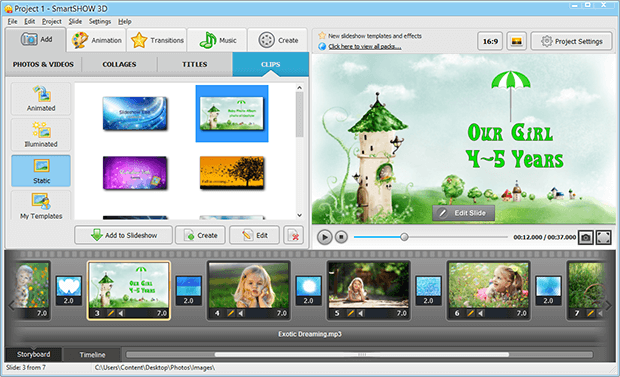 SmartSHOW 3D software offers you a vast collection of slideshow titles. With their help you can introduce your slideshow to the viewer, giving the title of the project, the name of the author and other important information. The program comes with 100+ ready-made slide titles divided into the Original, Themed and Simple groups. Some of them are quite universal and can be used in a project of any kind, while others are a perfect match for festive and themed slideshows. Want to make a unique intro for your slideshow? Check out our intro design tips to find stylish examples and professional secrets of how to create your own opening slides. Clips can be used to divide a project into logical parts or chapters, just like in our favorite books. 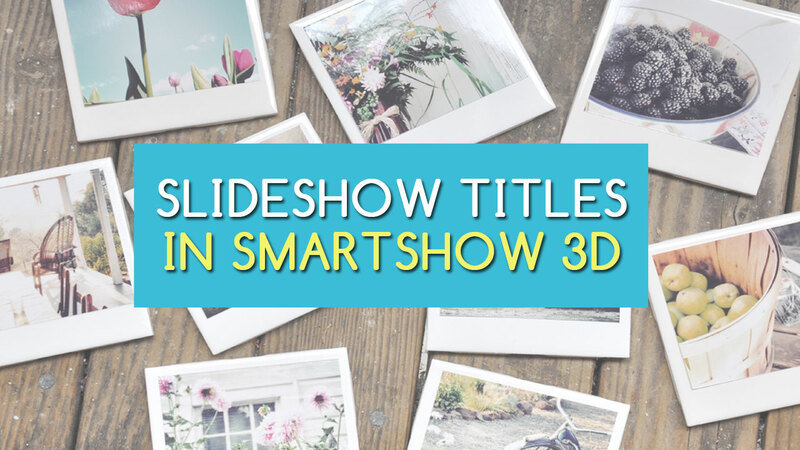 You'll find Static, Illuminated and Animated title clips in SmartSHOW 3D collection. While the static ones are rather simple and obvious, animated and illuminated title clips can be a real deal – the photos and text captions on the slide can move in space, fly in or slowly dissolve, which looks pretty awesome. To apply any of these slideshow titles, simply click on the effect you like and drag it down to the Storyboard. 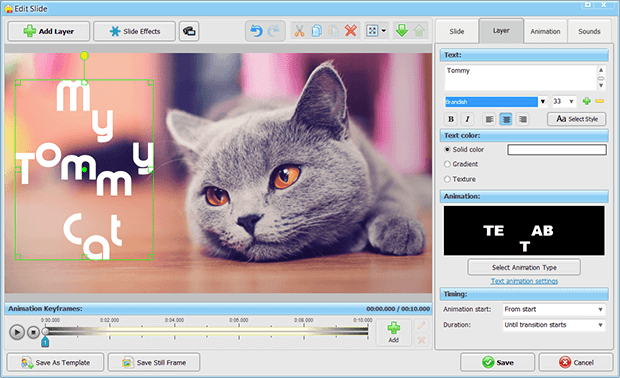 In SmartSHOW 3D, you can also add fancy subtitles to each slide. They are usually used to display different kinds of comments or notes for certain slides. For example, your slideshow theme is travelling to a foreign country. Use subtitles to explain what is going on or make an interesting remark. Subtitles can be animated as well. The easiest way is to use animated text. That way letters on your slide will move off the top, randomly rotate or appear in a typewriting manner. Want to try? Here is a video tutorial on how to work with animated text. If you are making a real photo movie, it should have not only a great opening but also a final slideshow title. It is up to you to decide whether it will be a suitable template from the program collection or your own design. Pick a suitable template and add it to your project. 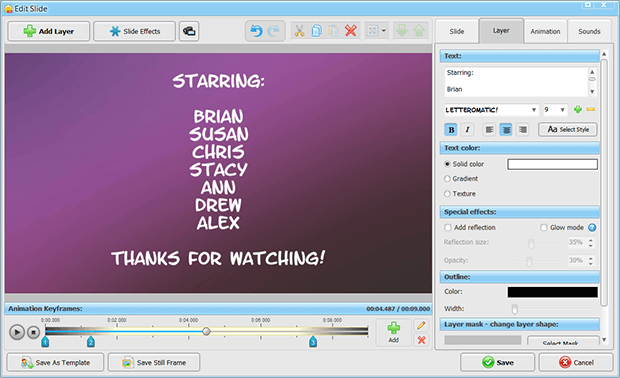 Next, type in the names of your cast, acknowledgements, additional comments and everything you would like to share. In case your rolling credits are moving too fast, simply extend the duration of the chosen slide. You can do it right in the thumbnail on the timeline. How about making your own slideshow titles to instantly win the viewer’s heart? Right-click on the slide you want to turn into a title and click Edit Slide. There you can add both simple and 3D text, with lots of customizable settings. Both types of text share some options, such as position, opacity, rotation (including 3D) and scale. In addition to these, 3D text has its unique features: different types of text warping – curve, wave, emboss with adjustable scale, and the lighting effect, which looks fantastic with colored text. Open the Animation tab to create animation for each of the text layers you have added. You can use different types of slide animation - Constant speed, Smooth, Speed up / Slow down, or try original Push out and Bounce off modes. Any animation type is set with the help of keyframes. For each keyframe you set the size, position and other settings of the object you are working with. All in all, animated titles make an important part of your slideshow. They help to get the general idea and enhance the overall experience. SmartSHOW 3D is a great helper in how to make a slideshow question, so don’t hesitate to check it out now, and make your photo projects even better!